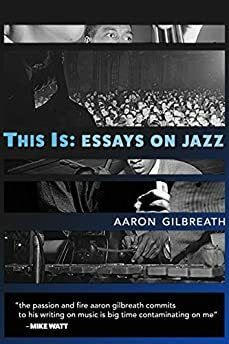 Largehearted Boy: Book Notes - Aaron Gilbreath "This Is: Essays on Jazz"
Book Notes - Aaron Gilbreath "This Is: Essays on Jazz"
Aaron GilbreathThis Is: Essays on Jazz is a vital and entertaining collection, one of the finest books on jazz (or any genre of music) I have read. "The richness of the eight essays in Aaron Gilbreath's This Is is a fitting tribute to the richness of jazz itself. Gilbreath weaves unique insight with a profound understanding of the history of jazz. His crisp prose and diverse range make you want to turn the page and run to the record store in equal measure." I love jazz ─ not that smooth, easy listening, cocktail hour stuff, but the soulful, infectious Be bop and Hard bop recorded between the 1940s and '60s by rebels in suits. The deeper I got into it, the more fascinated I became by its history and the forces that compel us to make things, be it music or literature. Reading about jazz generated certain questions in my mind, so I started writing essays to mull them over. My book explores both jazz and creativity, from the complicated genius of Miles Davis to the self-imposed exile of pianist Jutta Hipp, from the role heroin and sobriety played, to what it means when a song famously made as a first-take gets performed live for ten years. The book isn't a unified study. It isn't exhaustive. It's a collection of essays I wrote out of curiosity and appreciation then gathered between covers before I started obsessively writing about something else. The more I read about mid-century jazz, the more undeniably heroin was weaved into the music's development. Heroin didn't make jazz. Talented people made jazz. But heroin accompanied it through its formative years. Many musicians used it, some briefly, others for too long, and many never at all, but the drug's prevalence made me curious: how could a period of time marred by abuse also be filled with so many iconic albums, like Blue Train, Saxophone Colossus, Soul Station, Cool Struttin' and Kind of Blue? It mystified me. Heroin is horrible, but could it be helpful, too? It wasn't a question I heard people asking, because it's dangerous and anti-social, but the evidence suggested the possibility. So with an open mind I made a list: next to the names of individual musicians, I wrote the titles of the albums they were best known for, wrote the date(s) each musician got off heroin, and figured out which of the era's most celebrated albums were written before they got clean, and after. It was a fruitful exercise, and the divide wasn't so clean either. The larger question concerns the relationship between sobriety and creativity. We know the big picture: drugs destroy lives, kill people, waste talent. These are all true. But the relationship between art, intoxication and clarity was more complex than that, and I wanted to explore it in jazz and represent that complexity in a more nuanced way than the familiar good/bad, clean/strung out dichotomy. The jazz film The Connection provided an interesting lens. The Connection is the story of junkie jazz musicians waiting around one New York apartment for their dealer, and the soundtrack that pianist Freddie Redd wrote for it is badass. This song "O.D." is one of the fast ones. The title's dark, but the music is intense, triumphant, invigoratingly up-tempo. It fueled the writing of my book's title essay, "This Is." While planning a trip to Japan in 2014, I discovered Koya Abe's small used record store in Tokyo's Shimokitazawa neighborhood. Specializing in used jazz, blues and early rock and roll, Koya's shop sounded awesome, so I emailed him and we arranged a time to meet. When he and I went to dinner at an izakaya, we played each other music on our smart phones, including this. Many things slay me about this song. One of them is the way that the drummer's ride cymbal and high hat kick in when pianist Sonny Clark shifts from the quieter, softer intro into his long propulsive solo, and the musicians lock in tight. Koya felt it. Like so much jazz, this version is a cover, and Clark's rendition is lively and bright yet somehow, like his life and the song title, touched with darkness. I talk more about this in my book, but the brilliant, productive Clark died young. He was a sure-footed soloists, so light on the keys when building his intricate melodies, and so hard-driving when he swung. He's one of jazz's best pianists, and his music has developed a cult following in Japan. I wish it enjoyed the same in America. I discovered this happy song on that same Japan trip. While shopping for jazz in a store beneath a busy Tokyo street, I found the Detroit Jazzmen CD on a crowded shelf. I hadn't known it existed. This was one the things that excited me about shopping for jazz in Japan: albums that have lapsed out of print in the US stayed in print over there, and I wanted to find stuff I'd never heard of. Even though Detroit Jazzmen is a group recording by all-stars Tommy Flanagan, Pepper Adams, Paul Chambers and Kenny Clarke, guitarist Kenny Burrell has the most song credits, so the album's often listed as his. Some jazz guitar is corny. Like, really bad corny. This is not. Here, Burrell and the band swing hard, and the song is joyful and sweet. It reminds me of Japan, because once I found it, I listened to it over and over on that trip, including when I wrote the Koya essay. Although I'd had a few of Hipp's albums for years, I knew nothing of the pianist's life. Then one day I was reading some jazz history somewhere, and I came upon a scene where a guy from Blue Note Records drove from Manhattan to Jutta Hipp's Queens apartment to hand-deliver a $35,000 check for the decades of back royalties she'd accrued after she'd disappeared. It was such a cinematic moment, surreal and suggesting multitudes, that I knew I had to write Hipp's story. It took about a year. Many more years passed before the story appeared in print in the beautiful quarterly Apology magazine, edited and produced by ex-Vice editor Jesse Pearson. Hipp's album With Zoot Sims is considered her masterwork. It is masterful. But she scattered many jewels throughout her concentrated oeuvre. "Cleopatra" is one of them. The precise turns of its labyrinthine melody remind me of the circuit board complexity of Tokyo's city streets, and how easily you get lost in them. Hipp's song also has a desultory feel that reminds me how I felt during some of those days in Japan, wandering and exploring alone far from home, which made me wonder how she felt leaving her native Germany to play music in America, alone. Reading novelist Haruki Murakami, you come across countless references to American pop music and jazz. He turns song titles into book titles and his characters talk about records. To explore the influence of jazz on Murakami's writing, I visited the site of his old jazz club in Tokyo. It closed ages ago, but I had an awesome adventure there with two strangers and a bookstore owner who used to sell books to the young Murakami. The author now owns something like 10,000 records, but seeing Art Blakey & the Jazz Messengers perform in Kobe, Japan in 1964 started his love of jazz. This song "So Tired" features the same, or close to the same, lineup of musicians Murakami saw. It's from the album A Night in Tunisia, and these guys jam. It helped put me in the mood while writing much of the book, with its tight, in the pocket rhythm shaping my thoughts and ushering them through my typing fingers. The month after the Kobe concert, the band recorded an album called Kyoto. It seems Japan changed them, and the band changed Japan, partially, through Murakami's books. Speaking of Murakami, this mid-tempo song is a masterpiece of tone and color. It appears on Fuller's best known album Blues-ette, and makes an appearance in a pivotal scene in Murakami's nocturnal novel After Dark. The novel features a trombone-playing protagonist, and the title shares part of the song's title and late night hour. Fuller is a trombonist. Few wind instruments are as uncool and cumbersome as what they call the 'bone, but he tears it up and makes it swing, fast, slow and mid-tempo. When I saw Fuller perform in New York years ago, he wore a baseball cap that said "Old School." Some Japanese superfans sat on chairs right beside the stage, waiting to get their records signed. I shared their excitement. Fuller played on Coltrane's album Blue Train. He's a legend. I stayed for both sets and walked from the club to the train late at night, savoring the cool 2am feeling of New York City's streets. Written by Joseph Kosma in 1945, this French pop song became a jazz standard that everyone from Frank Sinatra to Nat King Cole covered. One of the most famous renditions is Cannonball Adderley’s on his album Somethin' Else. Adderly was a searing alto saxophonist who led his own band after making his name touring with Miles Davis and playing on Kind of Blue. Davis expressed his admiration by playing trumpet on this, Adderley's only Blue Note album as a leader, and one of Hard bop's best. "How do you call your Lover Boy?" "And if he doesn't answer?" His 1950's pop duo Mickey & Sylvia scored a hit with the song "Love Is Strange," but few people know Baker's name. Baker was an inventive, blues-based guitarist who played rock and roll but had wanted to be a jazz musician. Although he could sing, he was more known for his animated session work on other people's hits, including Ray Charles’ “Mess Around” and Big Joe Turner’s “Shake Rattle & Roll.” He only recorded a few of his own full albums. My favorite is Wildest Guitar, which includes "Autumn Leaves." 'Wildest' says it all. He played with delay and reverb pedals and double-tracked his guitar, often so one track played just behind the other, giving the music a psychedelic, sometimes welcomingly confusing quality. As Aquarium Drunkard put it, Baker's style "burst with expression" along with, I'd add, touches of surf guitar. His version of "Autumn Leaves" isn't jazzy. It's what rock musicians can do when they pass a standard through the unique filter. By changing the instrument and experimenting with effects, Baker refashioned this into a song you'd never expect to have been touched by Nat King Cole. Not surprisingly, Wildest Guitar also includes a cover of "Lullaby of the Leaves" and "Old Devil Moon." Baker truly reinvented the wheel. Miles Davis was a complicated genius. As a huge fan of his music, I struggled to reconcile his violence and aggression with his talent and the tenderness of his solos. So I explored that in one essay. My book also contains a piece about listening to Miles Davis' classic song "So What" over the course of his ten years of live performance. "So What" is one of the most beloved and well known songs in jazz. Its recording on Kind of Blue is said to be the result of pure first-take improvisation, because the band recorded it the same day Miles gave them the sheet music. This characterization's only partially true. Davis played the song in concert for a decade before dropping it from his repertoire. Listening to its many iterations led me to an exploration of the nature of spontaneity, freshness and improvisation in general. Jazz is an improvisational art form, so how does a song change as people play it over and over and over and over? I listened to "So What" over and over to find out. To me, it's a perfect song. Noted critic Leonard Feather described Mobley “middleweight champion of the tenor saxophone.” But there's nothing middle weight about this song or this album Soul Station. In my essay about Mobley, I sing his praises and describe my relationship with this song, so naturally, while writing the essay, I listened to it and many of the tracks off Soul Station on repeat. Jazz is music to live to, try to, love to, cry to. This song is the sound of pure joy. When The New Yorker culture critic Richard Brody found my essay about Mobley online, he called it a "Painful, beautiful appreciation." If it's pitiful to cling to a complimentary three-word tweet from one of your favorite New Yorker writers then call me pitiful, because I'm clinging. As Mobley experienced, praise for your work often comes too little, too late. One person's piss is another person's milk, and not everyone shares my love of organ jazz. The first essay in the book is about organist Jimmy Smith and the trove of unreleased recordings that Blue Note Records had, and still has, in their vault, which is about the power and wonder of the unknown. Smith is an incredible player, partly from his musical ability and ear, partly for his choice of instrument. When he started playing Hammond B3s, it wasn't seen as a sophisticated jazz instrument. Smith fixed that. He locked himself in his garage and tinkered with his organ until he figured it out, then he emerged and changed the face of jazz. Organ jazz might not be your thing, but you have to admit that the covers of Smith's albums Crazy! Baby and Home Cookin' would look good hung on your wall. From Billie Holiday to Anita Oday, most of jazz's best singers were women, but it's tragic and familiar how few female instrumentalists were recorded during jazz's golden age, or whose names get mentioned alongside men like Miles and Getz. Mary Lou Williams is one of jazz's great pianists. She played a lot, recorded less (and probably less than she would have preferred), but what she left on record is top shelf. I hate to use clichés, especially when writing about a musical form built on improvisation, but Williams truly paved the way for other female jazz musicians, both white and of color. I love Mary McPartland's early albums as much as I do Mary Lou Williams'. When people come over for dinner, I play The Marian McPartland Trio and Jazz at the Hickory House records in the background, and often when I'm writing, too. If you like jazz, you've heard "Stompin' at the Savoy" too many times. McPartland starts her version by paring the melody down to its most haunting elements ─ just chords, soft and sent drifting over the baseline ─ before diving into a mid-tempo romp that somehow makes the familiar enjoyable again. Here's a sad song. The first time it played on a Pandora station at work, I stopped whatever I was doing and turned up the volume. At that moment, I knew this was one of the special ones. I ordered the mp3 album and vinyl that week. This song has helped set the mood that lubricates my mind when I need to write, sometimes better than strong tea. Bagley was a bassist. He only released three of his own records as a leader, and this is from his sole trio session, Basically Bagley. Great stuff, but this dark, blue beauty is the highlight. Sometimes I like being sad. This song makes it feel good. Trumpeter Lee Morgan was a prodigy with a productive, busy career cut short by a dramatic on-stage murder. I wrote a short piece about it in the book. He played with everyone from a young age, wrote scores of lasting originals, and his death cannot overshadow his creative triumphs or the way he colored the entirety of Hard bop with his nimble, gymnastic solos. His style is so singular you can recognize it in a lineup. This soulful Morgan original appears on his stellar but slightly overlooked Lee-Way album. The title is a tip of the hat to Blue Note Records' co-owners Alfred Lion and Francis Wolff, and maybe, just maybe, also a reference to their dogged business practices.